Kouta Hirano got some exciting news this past week when the staff for the anime adaptation of his current manga, Drifters, was rolled out. Reading about that news reminded me of a list Hirano earned his place on with that series, and about someone else on that list we won’t be hearing as much about from now on. Typically, even the manga that command the greatest degree of fame and attention take a while to actually get to that point. Takako Shimura spent years writing 18+ manga under multiple pen names before creating the internationally recognized Wandering Son. Shingeki no Kyojin didn’t even make the charts when its first volume came out. Even undisputed king of manga sales One Piece took over a decade in print to surpass Dragon Ball’s 156 million copy total and become #1, and in the last 6 years it’s added about 220 million to that total. A big part of success for most of the authors who have achieved recognition is due to diligence and working a lot over a long period. 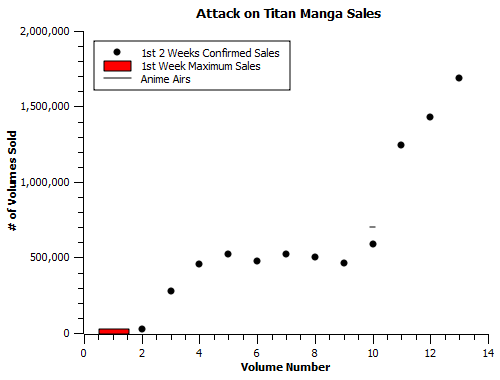 Manga that do amass gigantic sales totals from the launch date of their first volume tend to fall into one of three categories. First, there are the licensed spinoffs, adaptations of Sword Art Online and Mahouka and such riding the wave of another author’s popularity, often as part of a larger media blitz. Second, you have the extensions of existing popular manga series that decided to change their titles, your Major 2nds and Baki Gaidens. Lastly, you have the bona-fide originals, series which ride a name and a compelling start to immediate large-scale success. It’s this third category, the hardest one to break into, that most interests me. In practice, it breaks down into a list of authors with strong pre-established reputations doing other popular series and Jump newcomers, and it’s fun to look at in that “tough achievement to notch” kind of way.